Updated 9-28-11: Used a simpler approach for horizontal lines and improved "no alert" message handling so that these messages should always be correctly removed. 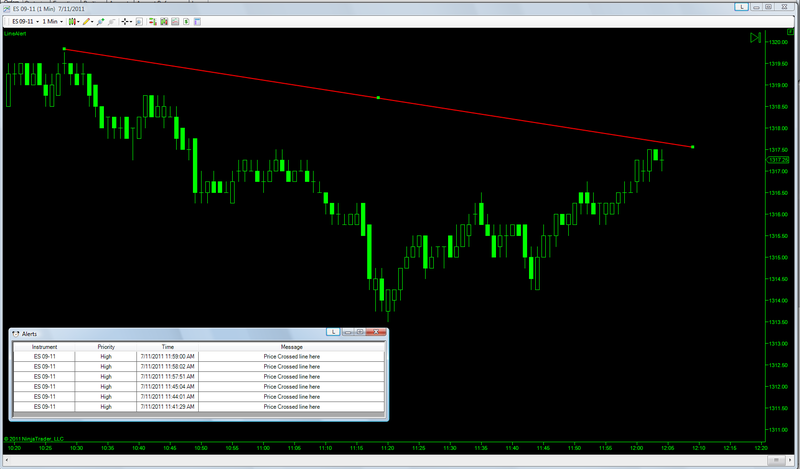 This indicator will alert when the most recent bar crosses manually drawn lines. Works on lines, rays, horizontal lines, and extended lines. Apply the indicator to a chart and manually draw a line. It changes color according to what is set in the indicator properties and alerts on crossovers, visible in the File > New > Alerts window. Code is documented and you can add additional actions in the designated block. Alerts are reset with each new bar or when ManualReset input set to true.